From the Editor- "Congenial Congeners" by Luis Ayala, Editor and Publisher. The Angel's Share- We welcome Mr. Paul Senft as a contributing writer. Rum Events- Interview with Mr. Javier Herrera, Director of International Rum Conference, from Madrid, Spain. Exclusive Interview- Interview with Mr. Robert M. "Bob" Gunter, President & CEO of Kōloa Rum Company, located in Kalaheo, Kaua’i, Hawai’i, USA. Rum in History- A timeline of what happened in the month of April throughout history from 1485 – 1830. 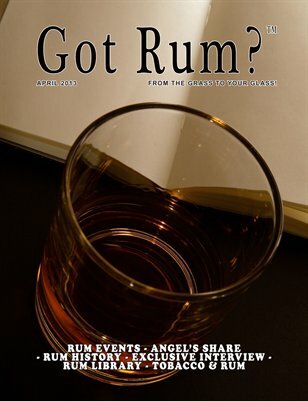 Rum Library- Book review of "Punch" written by David Wondrich. Rum & Cane Poetry- Cañal en Flor (Blooming Sugarcane Field) written by Alfredo Espino. Pairing Tobacco & Rum- Mr. Philip Ili Barake brings us “Boxing Night”, a pairing that unfolds like a boxing match.